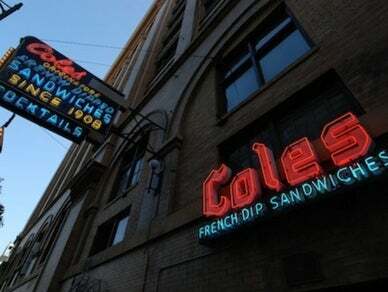 Cole’s is more than just a restaurant and bar. It is also a museum in LA’s historic downtown, and self-proclaimed home to the legendary French dip sandwich, which dates back to 1908. P.E. stands for Pacific Electric, the company that manufactured the famous Red Cars. this beef is lean and flavorful, inside a crusty roll. Ham, turkey and other options are fine as well, and plate specials such as turkey a la King will take you back in time.